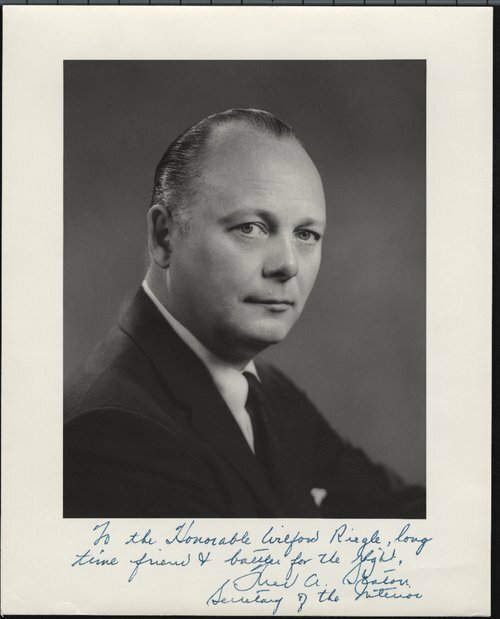 A photograph of Frederick Andrew Seaton who was born on December 11, 1909, in Washington, D. C., where his father worked for U. S. Senator from Kansas, Joseph L. Bristow. At the age of six, he moved with his family to Manhattan, Kansas, where his father published the Manhattan Mercury and later the Manhattan Chronicle. After graduating from Kansas State University in 1931, Seaton joined his father's newspaper business. In 1937 he moved to Hastings, Nebraska, where he published one of the Seaton family's new acquisitions, the Daily Tribune. Seaton worked on Eisenhower's first presidential campaign and served in several positions during Eisenhower's administration, including assistant secretary of defense and deputy assistant to the president. In 1956 he was appointed U. S. Secretary of the Interior and remained in that office through Eisenhower's presidency. After leaving Washington in 1961, Seaton returned to Nebraska and to the Seaton newspapers. He was very active in civic affairs and received numerous awards and honors. He died in Minneapolis, Minnesota, on January 16, 1974.